The Idaho Department of Water Resources was ready to call out the National Guard to enforce water shutoffs in the Mackay area when it was faced with opposition there, including from the Custer County sheriff, Director Gary Spackman told those attending a water-rights symposium Wednesday at the Community School in Sun Valley. Spackman said he didn’t expect tensions to rise to that level in the Wood River Valley, but he and other panelists said novel ways to distribute water will need to be found as conjunctive management of groundwater and surface water looms here in the near future. The panel “dream team,” as it was called by District 37 Watermaster Kevin Lakey, consisted of Spackman, former IDWR Director and now private water-supply businessman David Tuthill, attorney James Speck and engineer Chuck Brockway, as well as Lakey. The symposium was hosted by the Sun Valley Board of Realtors. “We’re going to have to be very innovative in dealing with what is going to be a shortage of the water resource,” Brockway said. Tuthill, manager of aptly named Innovative Mitigation Solutions, said a groundwater district in the upper Snake River Aquifer has bought water from a reservoir to provide water to senior surface-rights holders so its members can keep pumping from their wells in times of shortage. However, he pointed out, no such storage exists in the upper Big Wood Basin, so other ways will need to be found to mitigate the rights of downstream water users. Foremost among those is the Big Wood Canal Co., which owns the right to water in Magic Reservoir. Tuthill’s company has filed for new water rights from the Big Wood River to divert water in the spring and early summer to recharge the aquifer. The company would sign up customers to use that water as mitigation for calls from downstream users. “Our company is looking at underground storage in place of reservoirs,” he said. However, Brockway advocated the formation of a new groundwater district as a means of finding ways to rehabilitate the shrinking Wood River Aquifer. “I’m not sure that the incentives under private plans are as good as they are under a groundwater district,” he said. Panelists emphasized that domestic water use and irrigation of less than half an acre are exempt from water delivery calls. However, they pointed out, community wells are not entitled to the full domestic-use exemption. The symposium included questions from moderator Jed Gray and from the audience. One was whether a property owner connected to a community well can drill an individual well to obtain the full half-acre irrigation exemption. “I think you raise a question that really points to some inconsistencies,” Spackman said. He said some water rights holders have already been grumbling about the exemptions. Lakey said a groundwater flow model under construction by the U.S. Geological Survey and due to be completed in 2015 will allow him to decide which wells to cut off in the event of a delivery call. Spackman said the model will show how and when groundwater flows affect volume in the Big Wood River. Spackman said that on lots that are broken up into small irrigated and non-irrigated parts, the department includes the area of tree canopy in the irrigated portion, on the grounds that it’s about equal to the extent of the tree’s root system. However, both he and Lakey said they have neither the manpower nor the inclination to do such detailed inspections or to go around enforcing well shutoffs. 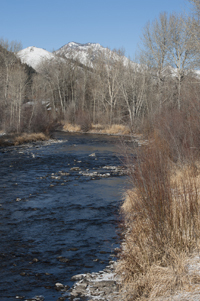 An audience member asked whether ponds such as those at Golden Eagle subdivision at the mouth of Greenhorn Gulch can be filled without a water right for fire suppression. Spackman said Idaho law allows for such a diversion, but holds the entity diverting the water liable for its value. Spackman said that adjudication of water rights in the upper Snake aquifer involved an “astounding” amount of money spent on litigation. He said he hopes that situation will be avoided in the Big Wood Basin.